Enjoy a lovely drive it yourself trip through the dune & beach area in the region of South-Holland. 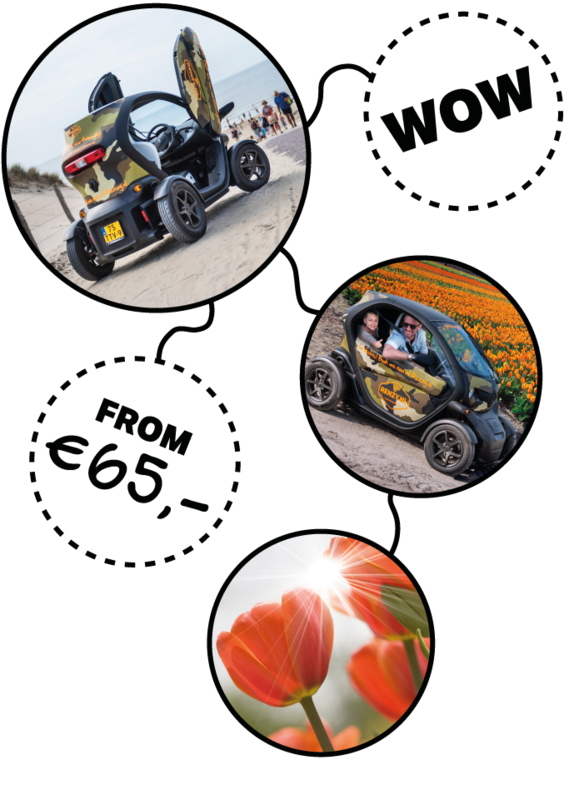 In a 100% electric 2-person Renault Twizy with GPS navigation, you will ride through free nature, sand dunes and visit the coastal town of Noordwijk & its hotspots. A unique ride at your own pace and off the beaten track. Feel the beach vibe! € 65,- for a 120 minutes GPS audio tour in 1 Renault Twizy, suitable for 2 people. The Dune, Beach & City GPS tour is available from 19 May to 31 October. We are open 7 days a week and for this GPS tour we offer 3 departure times per day. Meer en Duin 36, Lisse, The Netherlands. Enjoy a ride in the open air! Renzy.nl is located in Lisse and only 750 meters from the Keukenhof entrance. We are easily accessible by car or public transport. Ride with us and join the fun! "Very good tour with the electric Renault Twizy. It was lots of fun! If you visit this region, you will need to book one of the Renzy.nl tours. Congratulations and success!" Renzy.nl offers a unique customer experience to discover and experience the Dutch landscape & small historical cities in the region of South-Holland in a 100% electric Renault Twizy. All of our Twizies have a GPS Guide with detailed maps on board that guide our users along the route. The audio guide tour tells all ins and outs about the area and shares cool facts. So what are you waiting for, ride with us and join the fun!